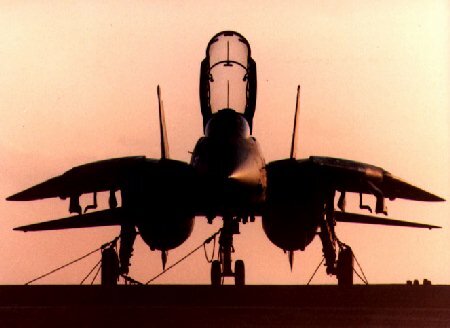 The F-14 Tomcat is the Navy's premier multi-role, carrier based aircraft. It is a two seat air- superiority fighter designed to deal with threats at close, medium and long ranges. It is powered by 2 27,080 lb thrust General Electric F-110-GE-400 augmented afterburning turbo fans (B&D models) giving it a maximum high altitude speed of Mach 1.88. Earlier A models used the Pratt & Whitney TF30P-414-A afterburning turbofan at 20,900 lbs. thrust. 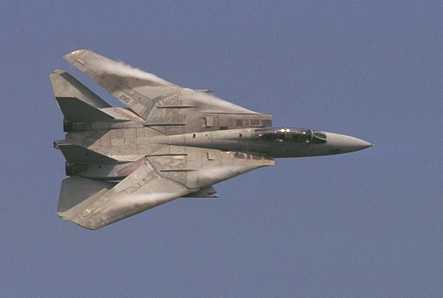 The Tomcat is a large aircraft at nearly 62 ft. in length and has a wing span of 64' 2" or 38' 2" swept and is 16' tall. It has a maximum weight of 72,900 lbs. Although it is large it is very maneuverable and is considered an excellent dog fighter. The F-14 carries AIM-9 Sidewinder air-to-air missiles and Martin Marietta (General Electric) M61A1 20mm "Vulcan" cannon with 675 rounds of ammunition for close range combat. AIM-7 Sparrows deal with medium range threats and the AIM-54 Phoenix is used for threats up to 100 miles away. The Hughes AWG-9, APG-71 electronic warfare package carried by the F-14 allows it to track up to 24 targets at once and lock and fire on up to 6. Some F14-Ds are fitted with the Tactical Airborne Reconnaissance Pod System (TARPS). The F-14 opened its score on 19 August 1981, when F-14 pilots Lt. Larry Muszynski and Cdr. Hank Kleeman of VF-41 "Black Aces" squadron destroyed a pair of marauding Libyan Sukhoi Su-22 "Fitters". Two MIG-23s fell to F-14s in a similar incident during 1989. The original F14-A first flew on 21 December 1970 and entered Navy service in 1974. The Super Tomcat 21 is a proposed multi-role adaptation of the F-14D Tomcat. It was proposed as a low-cost alternative to the Naval ATF, and drew heavily on the work done on Grumman's "Quickstrike" proposal. Like the "Quickstrike", the Super Tomcat 21 was to have a FLIR, and was to be provided with more modes for its APG-71 radar, such as synthetic aperature and Doppler Beam Sharpening for mapping. Four underfuselage hardpoints would have five munitions substations each, while the two wing glove pylons would have two substations. Naviagation and targeting pods could be installed. The Super Tomcat 21 differed, however, from the Quickstrike in making an attempt to reduce its radar cross section by a significant amount. In addition, it was to have been powered by improved F110-GE-129 turbofan engines which offered "supercruise" (the ability to achieve sustained supersonic cruising speeds without the need for afterburning) and would even have included thrust vectoring capability. The Super Tomcat 21 would also have featured enlarged tailplanes with extended trailing edges giving greater area, plus newly-configured wing gloves housing additional internal fuel. It would also have featured increased-lift slotted flaps and extended-chord leading edeg wing slats to allow no-wind carrier takeoffs or conventional carrier takeoffs at higher loaded weights. A new more powerful radar suite would be fitted, and the weapons delivery capability would be markedly enhanced by the adoption of helmet-mounted sights. The Attack Super Tomcat 21 was based on the Super Tomcat 21 but had thicker outer wing panels that carried more fuel. In addition, the aircraft would have provision for carrying larger external fuel tanks. Refinements to the leading-edge slats and the trailing-edge flaps were to give a 18-mph reduction in the landing approach speed. The aircraft was to have had the Norden radar that had been developed for the abortive General Dynamics/McDonnell Douglas A-12 Avenger II. The Attack Super Tomcat 21 has received quite a bit of attention as a potential alternative to the cancelled A-12. However, in the present military drawdown mode, both of these Tomcat 21 proposals share an uncertain future. One 20mm M-61A1 Vulcan cannon, 6 AIM-54 Phoenix missiles or 6 AIM-7 Sparrow missiles and 4 AIM-9 Sidewinder missiles, plus 14,300 lbs. mixed ordnance carried externally. Combat Radius: 378 miles on internal fuel; 750 miles with two 130-gal. tanks.